Trenton Elementary School principal, Mr. Michael Zboray, is pictured with Ms. Snow Ross’ third grade class who participates in the nationwide “Farm to School Program.” This USDA program encourages schools to teach children about where their food comes from and how it nourishes their bodies. The Bar Harbor Garden Club presented the school a monetary gift towards their greenhouse project and gardening endeavors. Each month the entire staff and student body taste a sample of something that they or local farmers have grown. 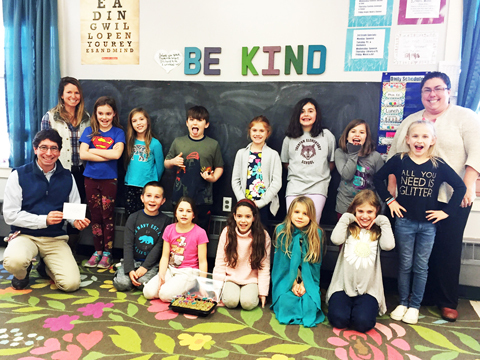 The class is pictured with a tray of “green” seedlings that they planted under the direction of Ms. Whitney Ciancetta, Ed Tech and Greenhouse coordinator. The Club gave monetary gifts to our five local schools, as well as Frenchboro. THE PETER H. DOLLIVER LEGACY SCHOLARSHIP inquiries are being accepted. The Bar Harbor Garden Club and the St. Croix District of the Garden Club Federation of Maine are proud to offer these educational scholarships in support of various horticulture and environmental related studies. These scholarships are designed to financially aid students who are interested in majoring in horticulture, floriculture, landscape design, botany, forestry, agronomy, plant pathology, environmental control, city planning or other garden related fields. Join us for our annual Valentine-making project. The Bar Harbor Garden Club’s February meeting will be held at St. John’s Church, 315 Main Street, Southwest Harbor on Thursday, February 14, 2019 at 1:00 PM. 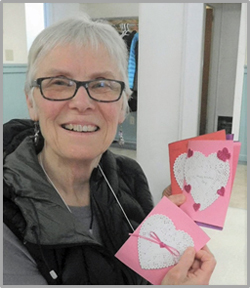 Making Valentine Tray Favors for MDI nursing home residents is a traditional activity for the Club. They’re easy to make and it’s fun. The Club will supply everything you’ll need. And we’ll give you lots of ideas should you want them. Our goal is to make 100 Valentines. So, we could use some help! All you need to supply is a pair of scissors. We’ll bring a few extra scissors, in case you should forget them. We hope that the Valentines will spread a little cheer to nursing home residents where it’s often much needed. We look forward to seeing you, and your scissors at our February meeting! All Club Program meetings are open to the community, unless indicated otherwise. Check out our 2018 – 2019 Program schedule. Thursday, March 14, 2019 at 1:00 PM at Birch Bay Village Inn, 25 Village Inn Road, Bar Harbor. “Native Plants” presented by Dr. Lois Berg Stack, Professor Emerita Sustainable Agriculture, University of Maine. Thursday, April 11, 2019 at 1:00 PM at St John’s Church, 315 Main Street, Southwest Harbor. Hands on Workshop: “Flower Arranging by Gardener, Artist, Designer“, Nina Hartman, On the Pollen Path.